TOOR-na-ment vs. TUR-nuh-mint. It’s a pronunciation argument that my buddy Josh and I have had for a long time. Really just the first syllable is disputed. I’m in the latter camp, he’s in the former. Merriam-Webster says we’re both right and introduces a third option, TOR-na-ment. I think we can both agree that guy is just plain wrong. On to my picks. Check out the thumbnail bracket below or click on it for the full version. As a matter of fact, you’re going to have to click on it unless you want to strain your eyes to the point of blindness. Showing great foresight, the NCAA came up with the catchy “March Madness” slogan, which I find most people can agree upon for pronunciation purposes. Next week, a discussion as to the title of the popular Thanksgiving side item (stuffing vs. dressing). By the way, UConn, Texas, Villanova, and UCLA in the final 4 with UConn beating Texas to win it all. 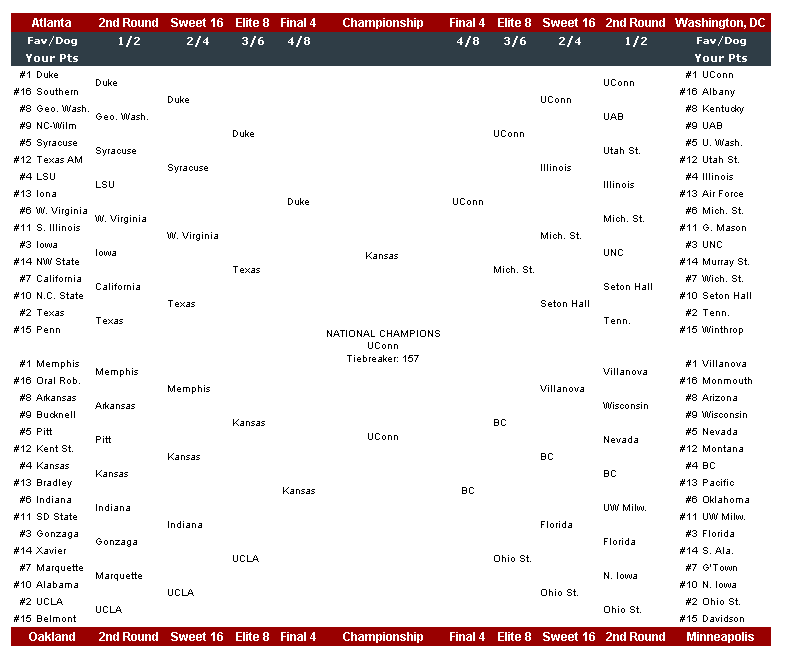 Yeah I almost had Texas and Villanova in there. I just think BC and Kansas are going to have great tourneys. I’ll be surprised if Gonzage makes the Sweet 16, let alone the Elite 8, Final Four or makes/wins the championship. A few years back they had that Cinderella quality and we’re balanced teams. This year it’s the Adam Morrison show. Stop him (admittedly difficult) and they lose.